Office building of three floors, 700 m2 on Schottegatweg Oost | € 11.653 / mo. This beautiful office building at Schottegatweg in Zeelandia will be available on October 1, 2018. 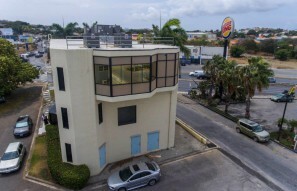 A great location for your business, 3 story level to be at your client service. It is very central located and is very easy to reach. The entrance of this building is equipped with a magnetic security lock. The ground floor consists of 235m2, and features a reception and a waiting room. There are six offices, a conference room and a storage. There is also a kitchenette and 2 toilets. Besides a staircase on the property there is also an elevator to the 2nd floor. All 3-floors are fully equipped with ceramic tiles. All the floors have a central air conditioning system. The 1st floor consist of 230m2 and has nine offices. A toilet is also available on this floor. There is also a main server room on this floor, from here run all the lines/cables thru the whole building. On the 2nd floor there are 11 offices and a toilet available. Total area of ​​this floor is 253m2. There Are 24 parking spaces. Public transport stops for the door! The owner of the property is responsible for the exterior of the building; every 3 years. He is also responsible for the care of the exterior of the windows of the building, the maintenance of the A/C, maintenance of the elevator and the landscaping. You as a tenant are responsible for the interior, the windows on the inside and for the air conditioning filters. The utilities that you want to use are for your own account. The connection of the existing alarm system is your responsibility. As well as the insurance for the inventory. If interested for the purchase of this beautiful office building, it is possible. For more information or to make an appointment contact Aida Moret.